Photographer Benji Hadfield (above) caught this lingcod on a deep sea fishing trip off the Alaskan coast. Photo Credit: Benji Hadfield | @alaskankayak. The jetboat slapped the ocean’s surface as we plugged through wind and waves at 35 mph. I spend a lot of time in boats, but the two-hour ride from Valdez, Alaska, to Montague Island was the bumpiest I’ve ever experienced. Even our captain let out a frustrated, “damn,” a few times during the ride. We left the Port of Valdez at 6 Sunday morning. After jetting through Prince William Sound, we were now in the Gulf of Alaska. You’d think the Gulf would be choppier than the Sound since the latter is surrounded by mountains. It was the opposite, though, and I think everyone on the boat was happy when Captain Brian Rhodes announced we’d reached the spot – a surprisingly calm, pale powder-blue piece of water a mile or so off the coast of Montague Island. This was both my first time in Alaska and my first time deep sea fishing. I was in Alaska with my buddy Benji, who lives in North Pole. Neither of us intended on hiring a halibut charter, but the salmon were late. It was the end of June and even the kings hadn’t really shown up yet, and the two rivers with salmon were closed to fishing because the return numbers were so low. So we improvised. Benji knew a cheap place to stay in Valdez, and we lucked into finding a boat with two empty seats for a Sunday charter. If you’ve ever been on a guided trout-fishing trip, don’t expect any similarities on a deep-sea charter. For one thing, we saw a fin whale right before we started fishing. “It’s a freakin’ fin whale!” someone exclaimed from the deck. The thing was 60 feet long. You just don’t see stuff like that on a trout river. Hell, not even on a trout lake. “Fin whales are the second largest animals in the world, behind only the blue whale,” said Alaskan Adventure Photographer Benji Hadfield. “They can reach 90 feet (27 meters) in length, and weigh 74 tons. In other words, this animal is 24,667 times larger than my dog Peggy. And it surfaced a mere 20 yards from our little fishing boat!” Photo Credit: Benji Hadfield | @alaskankayak. The sheer size of everything in the ocean isn’t real until you watch someone catch a 30-pound halibut and the captain says to throw it back. I watched that happen on this trip. The halibut was the guy’s biggest he’d ever caught, but our captain unhooked it without ever bringing it in the boat. “You can do better,” was all he said. On just about any other trip in the world, a 30-pound fish is worth a half-hour of pictures, backslapping, and recounting the catch. In the Gulf of Alaska, it’s just getting in the way of something bigger. Later that day after everyone but Benji and I had caught halibut, I hooked into something massive. It bent my rod in half and made the giant reel whine. At one point someone offered me a fighting belt to help take the strain off my back and shoulders. Fifteen minutes later I regretted not taking the thing. Everyone peppered me with questions while I tried not to let my exertion show. I ignored all the questions, but I wondered what I’d hooked into. Captain Brian reckoned it was a halibut. “A big one,” he said, gesturing to the sweat dripping from my forehead. Just when I thought my arms were going to give out, the fish gave up and I pulled it to the surface. It wasn’t a halibut. Writer Spencer Durrant (above) reeled in this hundred-pound skate fish off the Alaskan coast. 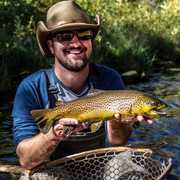 “Even the biggest self-proclaimed dry-fly purist will forget all about a size 16 Adams when he catches a hundred-pound fish,” he said. Photo Credit: Benji Hadfield | @alaskankayak. I thought it was something else, but Captain Brian groaned, let loose a string of profanities, and told me just how much he hates skates. “They act like halibut, but they take forever to land and you waste that time not catching halibut,” he grumbled. I can’t argue with that logic. Benji and I eventually filled our quota of two halibut and four rockfish each. The ride back to Valdez was smooth and quiet. We were all exhausted. The next day we headed north to the Tangle Lakes chasing whispers of big grayling and resident dolly varden. During the drive from Valdez to Tangle Lakes, I kept thinking about the halibut charter. I’m a fly angler and always will be, but there was something primeval and attractive about deep sea fishing. I don’t care that I was using half a cut herring and a two-pound lead weight. Any thought of catching fish the “proper way” went out the window when I got my first taste of what the ocean has to offer. I told Benji I’d go back again, and he agreed. But fly fishing is cheaper, believe it or not. Benji has a family and I’m a trout bum, so we were lucky to afford the charter in the first place. The next time I head to Alaska, I’m booking a deep-sea trip far in advance. If you’ve never been, I’d recommend it. Even if you go off Catalina Island in California, or anywhere in the Gulf of Mexico, or north up by Maine, you’ll have the time of your life. I once had an angler tell me every fly fisherman needs to visit Montana at least once. I think that was true, but Montana doesn’t expand your angling horizons. Deep sea fishing is a completely different world that every angler will appreciate, given the chance to experience it. Even the biggest self-proclaimed dry-fly purist will forget all about a size 16 Adams when he catches a hundred-pound fish.